Manchester City manager Pep Guardiola received a late welcome gift from reigning Premier League champions Leicester City as the Citizens were stunned at the King Power stadium by a rampant Foxes side. A Jamie Vardy hat-trick coupled with a goal from Andy King helped Claudio Ranieri’s side register a 4-2 win over the title hopefuls. Leicester City, in their characteristic fashion, sat back and absorbed pressure while hitting Guardiola’s side on the counter. Vardy opened the scoring in the 3rd minute before King doubled the lead less than 2 minutes later. 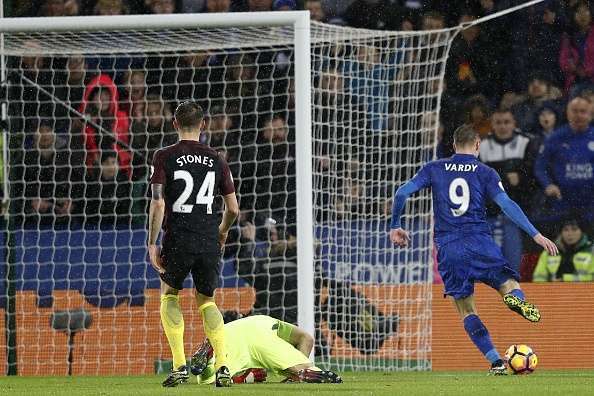 Vardy added his second of the night in the 20th minute before completing the hat-trick in the 78th minute. Aleksandar Kolarov and Nolito scored consolation goals for Guardiola’s side in the 82nd and 90th minutes respectively. Twitter didn’t hold back and was ruthless on the former Barcelona manager. Pep's tactics from Spain not working in England, also known as Messi. FACT: A bald manager has never won the Premier League title. "Conventional keepers come out and make themselves bigger. What if ours made himself ... smaller?" "By God, Pep, you've done it again." Pep may look good in a turtleneck and Converse but he's getting undressed in the Premier League isn't he? Manchester City are still yet to register a shot on target. If Guardiola had hair, he would have lost it all by December in the Premier League.. Pep Guardiola really pushing boundaries with this new false goalkeeper position. Pep Guardiola should recall Joe Hart from Torino and just stick him at centre-half. If Man City really want a revolution under Pep, they need to completely overhaul their defence. 3 of their starting back 4 need to go IMO. Leicester are currently beating Manchester City 3-0. 20 minutes on the clock. Laughable how many people got overexcited by Pep Guardiola. But, but... Pep is on the touchline shouting and gesticulating wildly, how are they not winning? Pep got this horribly wrong. Played right into Leicester’s hands. Did he not watch any of their games last season? Won 0 Drawn 11 Lost 80. The worry with Man City is what kind of mess Pep Guardiola leaves for Sam Allardyce to clean up when he takes over next season.